This is a LCD pole bracket with an adjustable height clamp for 35 mm (1 3/8") pole diameters. Now you can add an extra LCD mount bracket to any 35 mm pole, and to any of the LCD desk-stands on our website, as well as to our DVC03 pole carts. The pole must be exactly 35 mm. in diameter for the clamp to work effectively (1 3/8"). Easily adjust the height of your flat panel monitor by using the handle, as shown in the pictures below. The LCD bracket tilts 90 degrees up and down, and also swivels 90 degrees to each side. In addition, the bracket also rotates 360 degrees for portrait or landscape viewing. The clamp also rotates 360 degrees around the pole, so the monitor can face virtually anywhere. 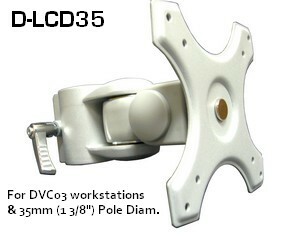 This is the same pole clamp used in all our LCD monitor pole-based desk mounts and on our DVC03 LCD Pole Workstations. What fits? This flat panel monitor pole clamp is designed to be used with monitors ideally up to 27" in diagonal width and weighing up to 25 lbs. The monitor must have mounting holes in the rear panel, with a VESA hole pattern of 100 or 75 mm. If you monitor has a 200 x 100 hole pattern, and is in the above weight range, we also provide an optional VESA 200 to 100 adapter.